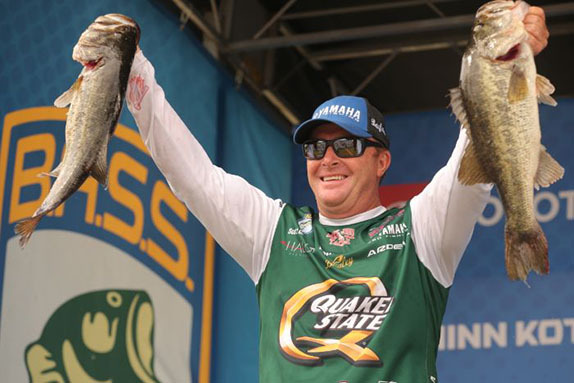 Kelly Jordon's 82-pound haul on day 1 gave him a lead of more than 18 1/2 pounds in Group A. 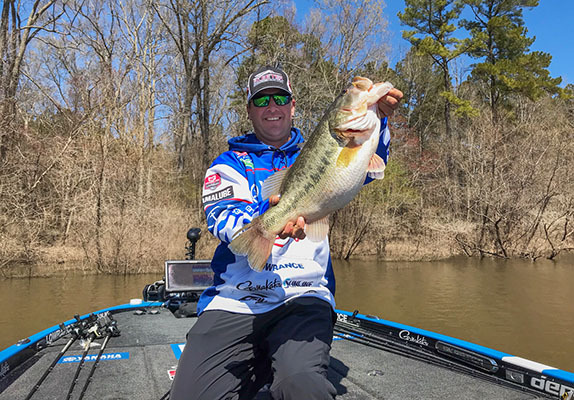 North Carolina's Lake Jordan showed that it's a good place to catch a lot of chunky bass on opening day of the third MLF Bass Pro Tour event. Kelly Jordon caught a whole mess of them. The veteran from Texas boated 26 fish that combined to weigh 82-04 en route to dominating the Group A Shotgun Round. 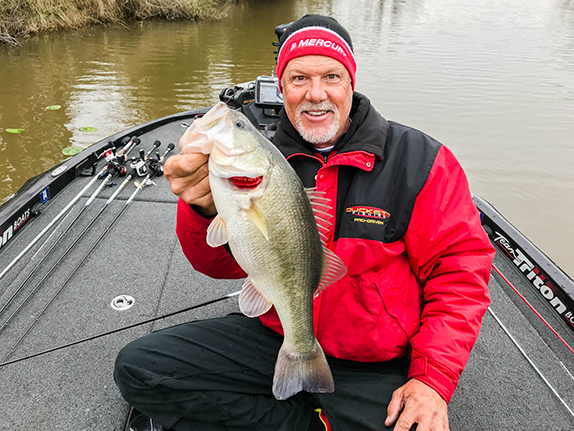 That was six more bass than anyone else in the 40-angler field handled and the weight differential between him and 2nd-place Todd Faircloth, another well-seasoned pro from the Lone Star State who caught 20 fish, was more than 18 1/2 pounds. "It was just one of those days that was completely ridiculous," said Jordon, whose haul was topped by a 6-02 specimen and six other fish that exceeded 5 pounds. "It was awesome to catch a bunch of big ones like that." Jacob Wheeler was 3rd with 54-05 (14 fish), followed by Mark Daniels Jr. with 52-01 (12) and Edwin Evers, the winner of the previous event at Lake Conroe, with 50-06 (19). Wesley Strader led the second half of the top 10 with 47-06 (15). Greg Vinson had 41-10 (10), followed by Randall Tharp with 38-03 (12), Andy Morgan with 31-02 (10) and Mike Iaconelli with 31-01 (12). Only six competitors failed to catch at least one 4-pounder. Faircloth's 9-04 bruiser, which he caught early in the third period, took big bass honors for the day and there were 12 fish that registered at least 7 pounds. Group A will take Wednesday off before returning to action Thursday at Falls Lake, which is located on the other side of Raleigh (Jordan lies to the north of the city). The anglers in Group B will get their crack at Jordan on Wednesday, but could find the big bites a bit more difficult to come by due to the pressure applied to the fishery on day 1 and the full onset of a cold front that will knock overnight temperatures into the low 30s. 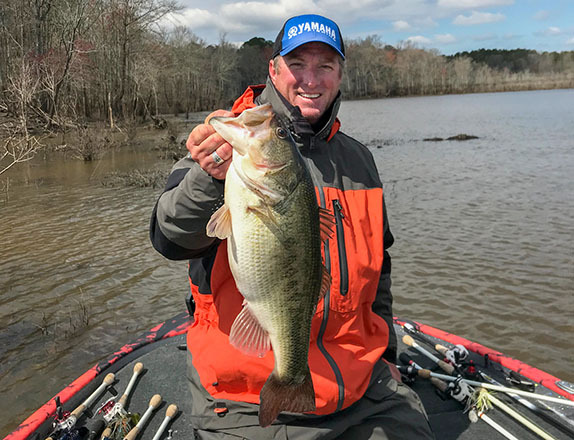 Jordon, who finished 40th in the season opener at the Kissimmee Chain and a disappointing 73rd at Lake Conroe in his home state, found the secluded backwater he exploited during the afternoon of the final practice day. He had it all to himself on day 1 and was actually worried whether he could get back out due to the water dropping about 6 inches over the course of the day. "Fishing was really tough in practice," he said. "When you look at the recent history of the water levels, two weeks ago this lake was like 17 feet high. I tried to figure out where a bass was going to go under those conditions and I knew a lot of them would try to stay there. Todd Faircloth's 9 1/4-pounder was the biggest fish on a day during which 12 that exceeded 7 pounds were caught. "I'd checked some similar stuff and basically caught nothing, but I hit that one at the right time. The water was 61 degrees yesterday and I knew they had to be there. I got a couple bites and said, "Okay, they're here," and after that I couldn't keep them off my bait." He caught some fish flipping and some on moving baits on day 1. He said he lost nine quality fish. "Two of those were over 8 (pounds) and might've even been 10. I lost four of my first five bites � it was that spawn bite where they're just slapping at it. "The water got up to 63 degrees this afternoon and I caught two 5-pounders in the last 10 minutes. I would've liked to have had one more hour to see what I could catch." 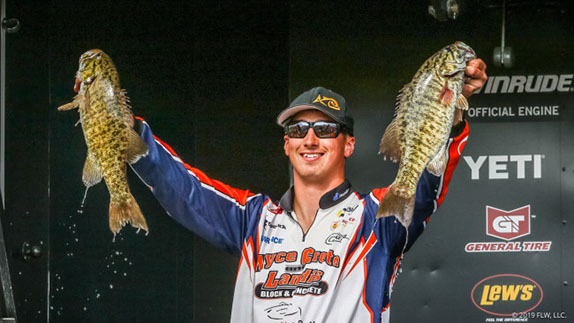 Faircloth was in 30th place after the first period with just two fish for 2-08, but leap-frogged almost three-quarters of the field from that point forward. He had three fish that topped 5 pounds in addition to his 9 1/4 monster. "I was definitely surprised by what took place today," said Faircloth, who did a lot of his damage with a flipping stick. "The sun came out and I don't think that hurt anything � it seems like it's been months since I've seen the sun when I've been fishing. "I changed areas and techniques going into the second period and it paid big dividends. Areas where I'd gotten a few bites in practice, I got a lot of bites today." Wheeler said he had a good practice day on Jordan and expected to see some eye-popping numbers posted on day 1. His big fish wasn't huge (5-11), but he backed it up with eight that weighed 4 or more. "Flooded hardwoods seemed like the deal and they had to have some depth with the water dropping," he said. "I felt like some of those bass were spawning. I had one boil at a vibrating jig and I came back three minutes later and flipped a creature bait in there and shook it for awhile, and I caught it. With a big cushion toward making the top 20 in his group, he'll spend much of the Elimination Round practicing for Saturday's Knockout Round. "I'm not as confident about Falls as I was about Jordan. I caught some bass there, but I didn't feel like it was on this level. I also think that with the cold front, it's going to be a little bit tougher. We'll have had two cold nights in a row by then and that might knock things back a little bit." There was nothing about Daniels' practice day on Jordan that told him he'd compile a total like he did on opening day. "I only got five bites, so I really didn't know what was going to happen," he said. "I'm not going to say I changed anything, but I fished harder and tried to catch everything I could, whereas yesterday I'd get a bite or two in an area and leave. "Today I really got an opportunity to see what was living there, and lo and behold, there were some bigs." His scoresheet included an 8 1/2-pounder and two that were over 6. He caught everything from woody cover in shallow water. "I just had an excellent day where everything went right. I didn't lose any, and that's a rarity in these type of deals. It was just one of those special days."